Nothing to see here, just a quiet corner of the goods yard - the coal merchant's scales, a rusty oil drum and a couple of coal staithes. Whilst beyond the concrete fence, the Southern National bus awaits to take passengers to Broadwindsor and Beaminster. that looks really good Tim, how did you make the rust on the oil drum look so good? Apart from the scales, everything is scratchbuilt. sorry, i should have said , how did you get the rust effect on the oil drum. My apologies for the long delay, almost six years. In that time, things have gone badly awry, the layout has undergone a number of seismic changes but at the start of September, a new start was made and the dormant layout has started to come back to life. The trackplan has been revised and simplified, the fiddleyard holds just six trains but a spur to a creamery increases the potential for movement. Essentially, still the same concept, a backwater of British Railways (SR) during the late 50s with steam locos hauling short, antiquated trains. Simple is good many people make the mistake of overcrowding the layout with track leaving precious little space for scenery. As long as there is enough track for your needs and enough for operating fun that's fine the old less can be more. I assume the upper loop siding is where the creamery is? I work on a 50/50 rule balancing scenery to track, others fill the baseboards but it simply a personal choice of railway within a landscape. The previous plan lacked the potential for successful operation, just ten fiddle yard tracks, a similar goods yard and a double track circuit. The spur adds the movement of tank wagons between the station and creamery, whilst single track forces trains to use the loop in order to pass each other hence more operational movement. It also fulfills the 'small train' concept, the local trains are just three coaches plus small loco, again part of the railway within a landscape concept. The platforms are as short as the local trains (all other merely pass through) and I have used lower than modern platforms to reflect the 'undernourished' nature of the line and because anything wider/higher would merely emphasise their length. Although the Dorchester & Exeter Coast Extension is a 'what-if' project, real Dorset stations are used in the planning, Verwood provides much of the inspiration as it shares much of the D&E's features - single track route, exLSWR, low population, route restrictions, closed. The lovely curve of Verwood (see picture) has been 'flipped' so that the down platform (with shelter) becomes a concave curve and the sidings swap ends. For more information either click here on on my signature. Peco buffer stops are excellent, the wooden beam is two layers of a coffee stir stick that has been stained with ink. Look forward to seeing more liked the pictures of the short trains with bigish looking locomotives. How are you doing the plants that add a splash of color commercial made or home made? I think that the flowers are Busch products, they are the bearded iris, a common but attactive weed. The most common variety is purple and a dab of paint improved them. Please note that the intention is to run small antiquated trains with small locos (see post 12.22pm). See here:- Stocklist and I have a D15 4-4-0 (see the photo) which is not really suitable but the layout is based on a 'what-if' concept. Just over a week ago, work began on the station area, it required a certain amount of excavating the existing scenery and rather than installing the track to pre-cut platforms and I had to adapt the platform shape to the existing trackplan. The first problem was the down platform, a business card placed against the sleeper edge provided a uniform distance, a flexible piece of wood and a marker pen created a black line which was followed with the circular saw in the Proxxon drill, finally an old bread knife broke the glue under the foam. Thinking about how to do the task took several cups of tea but about five minutes to accomplish. The all important clearance on curves is simply fixed by a small 10mm wooden block against the sleeper edge and fixed in place with a dressmaker's pin. Repeat this every 55mm along the intended length of the platform, a bead of PVA and install the balsa stripwood platform wall. The balsa was held is place by rows of ordinary dressmakers pins and the combined weight of some handtools. The platforms tops are 2mm ply, all cosmetic platform facings will be Wills. Total cost was about £12 of 12mm balsa stripwood and 2mm ply. The reduced height and width helps to disguise the extremely short platforms, just three coach + van long. The square end of the platforms is due to the siding, steps will be added for railway personnel - see the image of Hayling Island. Passengers will cross the track by a barrow crossing (not yet installed) at the opposite end of the platforms, access will be supervised by the signal box and a warning bell. Sunday morning chores in the workshop - clean up time. I used to own this, a U class made from bits of from DJH+South East Finecast+Hornby, it was sold in 2013, when Bill Jones passed away and I lost all interest in railways. Unfortunately, the DJH kit of the U and U1 class have been long out of production, prices have risen and even an incomplete kit recently sold for £160. When a completed U1 popped up on eBay described as a U, interest was aroused despite the SR livery and uncertain provenance however it had been built for Alton Model Centre and they have a good reputation. It is uncertain whether it can be converted into the more common U class however two U1s were loaned to the SR's Western Division to replace the T9s but were not liked, maybe it can represent one of these unwanted locos. 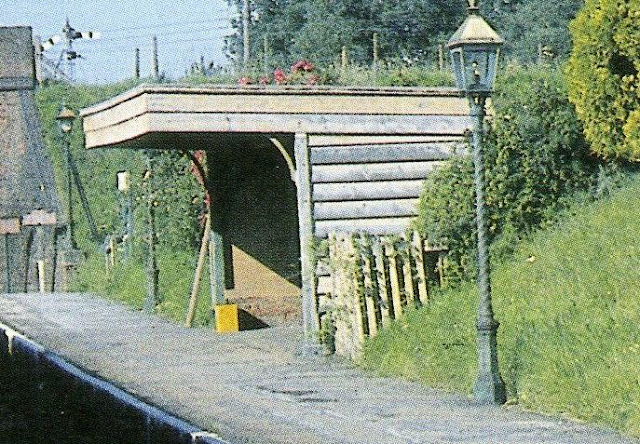 The surface of the old goods yard on Beaminster Road was a layer of ordinary cardboard box, selected as the same height as Peco sleepers, it was painted concrete to both seal the surface and represent the surface upgraded during WW2 when 'dirt' yards, such as Seaton Junction, were paved to allow rigorous use by the military. The weedy lines represent the expansion gaps to prevent cracking of the concrete surface. Six years have passed and another cardboard box is being re-cycled under heavy objects in preparation for another goods yard surface. The early 60s image of Verwood illustrates how standard Southern colours fade and deteriorate, although the ambient springtime light does make a big difference. It will be interesting to see how playing with the platform dimensions works. There are a few visual tricks at work; the platforms are short, low and narrow, the buildings are 1:76 but chosen for their small size, the fencing height is reduced, pale colours complete the illusion. The station represents no more than a halt with a passing loop, similarly the goods yard is very basic, just two sidings. By reducing the fiddleyard from ten to six sidings, this allowed me to run a spur to a creamery placed in front of a view blocker (hiding the fiddleyard) and providing me with operating potential with milk tankers and vans. Although only 4,8x3m the layout combines both movement and a sense of space by restricting the ratio of track to 50/50 with the scenery, the station may be small but it is in proportion to the layout. Is anyone, apart from Buz, actually reading this? Not particularly exciting but the goods yard has been covered in a layer of (box) cardboard, a ramp carved from foamboard and then sealed with a coat of Heki 6600 textured concrete paint. Tomorrow, a few more layers of colour or Stangel Acrylmasse, it is fun and artistic. After some difficult searching, a pack of SR Barley Twist lights have been procured. They are simply superb tho' just a tad too high but by using the shortest base they are very nice. A pack of six including two wall bracket lamps was less than one Viessmann lamp and they are supplied with a special circuit board - wonderful. DCC Concepts sold the distribution rights to Gaugemaster and the SR barley twist lamps sold out very, very quickly. In the meantime, I have been creating some new contours on the once-abandoned Beaminster Road. Most of the work has been the creation of the station platforms, they do not look as if they were just plonked down, instead subtle contours have been created so that they 'blend' into the landscape. 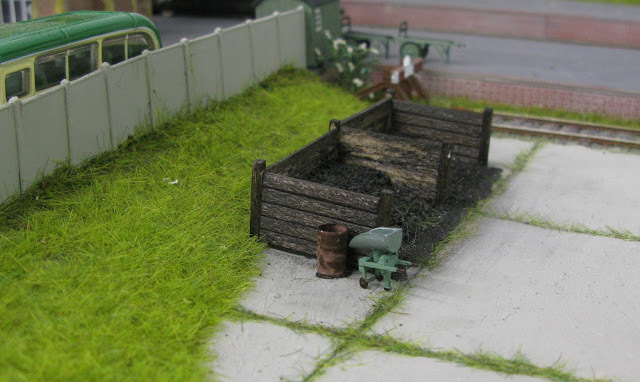 A Stationmaster's House and garden are being built and will located on the hillside some 15mm above the adjacent trackbed, the scenery shape is 5mm layered foamboard blended into the surrounding scenery with Advanced Polyfilla that has been smoothed with a wet 25mm brush. The work is easy but very time consuming whilst the stuff cures and dries for at least 24hrs. Parts of the old layout (the brown bits) have been retained as I was too idle to remove them, it also saved about a week of nugatory work. Ignore the 'unfinished' appearance, this is definitely a 'work in progress' moment. The ground colour is Chocolate Torte from B&Q, it isn't too chocolate and actually resembles the local colour scheme in West Dorset of mud and grass. The SM's house and garden are just placed to give some idea of colour and proportions, it looks pretty sparse because that is the intention. For the next couple of months, the only work on the layout will be scenery and re-testing, though a break is being taken during Christmas to run some trains. The roof is painted charcoal with a layer of ground white pepper. Somewhere in the waste bin, there is a tiny Mars wrapper. This is my first attempt at a video, thankfully it uploaded on to YouTube. I cannot post the YouTube URL as the iPad will not allow me copy it, bummer. The video clip shows a OO Works D15 4-4-0 running-in, a process that is essential for all metal gearboxes and kitbuilt locos. This is the model, though old fashioned compared with a Hornby T9, it is both accurate and realistic. It is fitted with a ESU LoPi and an extra set of pickups on the tender. Within living memory, most large villages had an independent motor car repairer, possibly a legacy of the local blacksmith. These establishments would attempt repairs on most motor vehicles, supply and fit tyres, coal, paraffin, even fix your bicycle. Away from the coast, West Dorset, is somewhat off the beaten track and Tilly's Garage would have been typical of the area, just a single wooden building with an attached office, it would serve the community until Mr Tilly's retirement. Tilly's Auto Repairs started as a Wills garage, the roof has been painted to represent corrugated asbestos with the moss starting to gather. It has a fully detailed interior of correct period advertising and piles of old tyres outside. The car is an Austin 7, an economy model that was produced from 1922 until 1939 in the United Kingdom by Austin. It was nicknamed the "Chummy" or "Baby Austin" and was at that time one of the most popular cars produced for the British market and sold well abroad. Before the Land Rover became available on the home market, vehicles in rural communities tended to be suitable for the area, West Dorset's narrow lanes and short distances were ideal for the little Austin. They could go almost anywhere, in 1928, an Austin 7 was driven to the top of Ben Nevis by a Mr G F Simpson of Edinburgh. Moreover, easy to fix and economical, they were still a common sight in the 50s.